Sometimes having a boat (or getting a ride on one) is the ticket for getting some sun, and that approach is often useful in the spring here in the Northwest. The spring is the time of maximum instability of our atmosphere, the time when we see the most convective cloud and showers. The reason is clear: spring is when we have the maximum change in temperature with height. The atmosphere is still fairly cool, while the sun is near maximum strength and thus can effectively warm the surface. When the temperature change with height gets large enough, the atmosphere starts percolating (or convecting), with the upward moving air producing cumulus clouds. Since the water does not warm quickly, there is little of this cumulus activity over local water bodies. Today's MODIS satellite imagery shows this very clearly. The picture above shows the 1-km resolution image from MODIS (the Aqua satellite), lots of clouds (cumulus) over land, but little over the Strait and the Pacific coast. You will notice a thin strip of the coast is clear; that is the zone influenced by the cool air over the Pacific at low levels. Here is an even higher-resolution view (250-m resolution). Clouds tend to form preferentially over the higher terrain, and valley bottoms are often relatively clear. 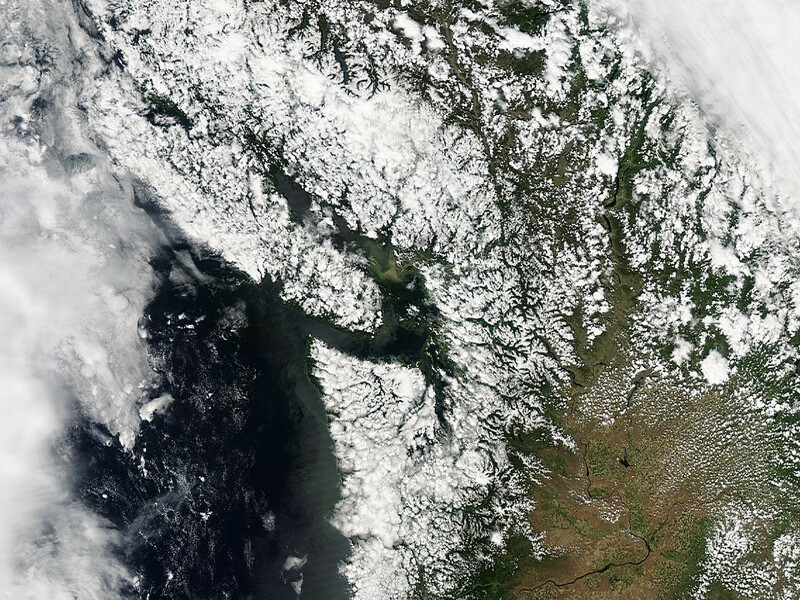 If you look closely, you will see some clouds forming over some of the bigger islands such as Whidbey and Orcas. A weak frontal system is now approaching our coast...the Langley radar near Hoquiam shows it for offshore at 9:40 PM Friday night: We will see increasing clouds from this system Saturday morning and light rain should be generally limited to the northwest portion of the State. The situation should improve later Saturday as this feature moves eastward. Generally dry weekend for most. 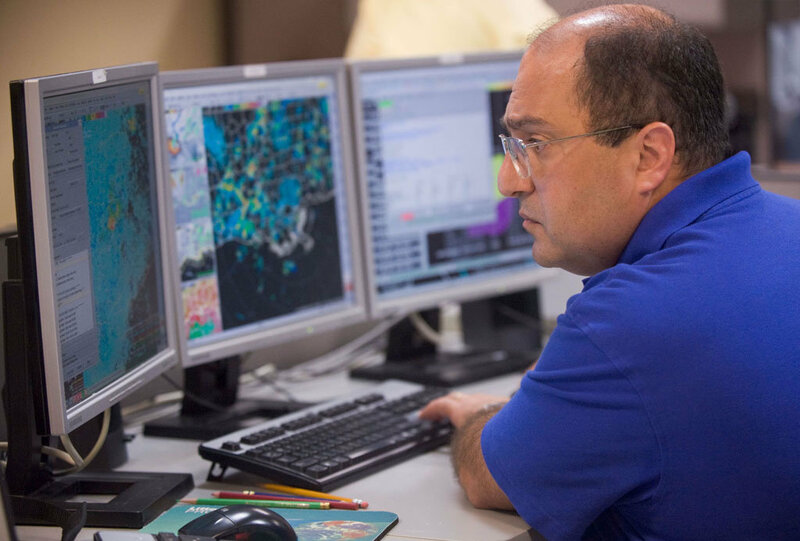 Twenty four hours a day, every day of the year, National Weather Service forecasters are watching the weather. They make regularly scheduled predictions. They watch for and predict extreme weather. At the coastal offices, there predict ocean (or Great Lake) water levels and waves. Or provide tsunami warnings after major earthquakes. They forecast the dispersion of smoke from wildfires and help predict the behavior of major fires. They determine how airports operate and who can fly. The put out warnings when air quality deteriorates. In a real sense, they are the nation's environmental guardians and are a major jewel of the National Weather Service. But local offices are in trouble: underfunded, undermanned, and underappreciated. And there are major questions regarding the role of local human forecasters in the future. This blog will examine some of these issues. First, some background. 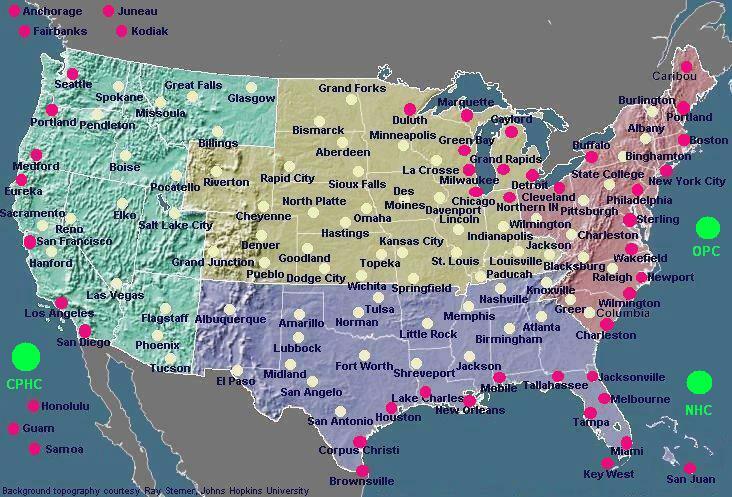 There are roughly 120 forecast offices around the U.S. (see map). They are staffed by professional meteorologists, hydrologists, meteorological technicians, and some administrative staff. Virtually all are associated with a Doppler weather radar. And they are backed up and added by specialist colleagues at the Storm Prediction Center (SPC), the National Hurricane Center (NHC), the Aviation Weather Center (AWC) and river forecast offices (like the one in Portland). National Weather Service meteorologists are highly trained. All have at least a B.S. in meteorology, with many possessing additional graduate degrees. In addition, the NWS has an extensive training program for all forecasters, including some wonderful computer-based modules created by the UCAR COMET program. Newly hired forecasters go through a several year internship/journeyman program before moving into lead forecast positions. Sitting at multi-screen consoles, forecasters have sophisticated display tools for examining model output and observations, and can make their forecasts by creating graphical renditions of the expected weather. But years of budget cuts are now having a severe toll on these public servants. With lack of funding, many NWS offices are not filling positions, with some offices down 2-3 forecasters (a few even more). Forecasters used to have research or supernumerary shifts that allowed them to improve their knowledge base, but with a lack of staff such opportunities have become far less frequent. Funding for going to conferences has been essentially eliminated, so that NWS forecasters can no longer go to relevant national conferences (like the American Meteorological Society Weather and Forecasting Conference). At our last year's NW Weather Workshop only the Seattle office forecasters could come...in previous years we would have several NWS attendees from Oregon, Idaho, and Alaska. With a lack of time of additional education and an inability to attend important meetings, forecasters lose their technical edge. And we all suffer as a result. Last year the situation got so bad, that the head of the NWS had to use creative finances to just pay salaries...and he was given the boot for doing so. And now with the exceedingly dumb government sequester, NWS forecasters face several days of furlough, further exacerbating the situation. It is an embarrassment for the nation that we cannot support our nation's forecasters in a reasonable way, with cuts undermining their ability to remain current or to improve their knowledge. And lack of personnel results in overworked forecasters, which clearly can degrade the quality of their work. NOAA needs to give support of our local offices more priority. 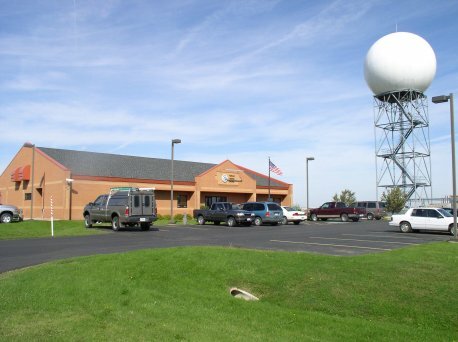 As the quality of the numerical models have improved, some NOAA bureaucrats have been hinting about a reorganization of the NWS office structure, saving money by closing offices and creating larger superoffices serving much larger areas. My take on this: a big mistake. 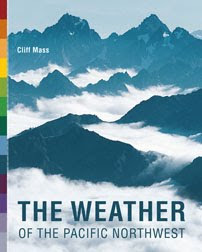 A key advantage of the current structure is that the area of responsibility of each office is relatively small, thus allowing forecasters to develop an intimate knowledge of the local peculiarities of the weather of their region. This is critically important knowledge. Just as important, forecasters get to know the users of weather information in their area and can develop personal relationships with key individuals in local governments, departments of transportation, and large local businesses. Such relationships would be difficult for the staff of a distant superoffice. As numerical weather prediction improves, NWS forecasters will need spend less time on the production of the forecasts for the next few days, but there is still plenty to do. First, there is helping local agencies, groups, and individuals understand and use weather forecasts. The new motto of the NWS is "Weather Ready Nation." That implies far more than simply making a weather forecast...it means helping users of weather information to optimally apply the forecasts. That takes a long-term relationship and lots of education regarding the strengths and weaknesses of forecasting products. NWS forecasters need to spend more time on the achilles heal of weather prediction...the very short term period (0-3 hr). To do so they need to put more effort in nowcasting, describing what is happening now and in the next few hours. And NWS staff require sufficient time to enhance local weather observations and to identify and fix incorrect sensors. This is particularly time consuming in this era of huge number of surface weather networks. The students graduating programs such a mine at the UW will be filling the NWS forecaster ranks during the next few decades. Their future, and that of the NWS is bright, IF NOAA management will insure proper support of the field offices. For the last few years, lack of investment has undermined and hollowed out these crucial guardians of our safety and economic health. This needs to change. One place to find some resources is to reform (and probably eliminate) the NWS's current inefficient and expensive region structure. The U.S. is divided into regions (e.g., the Western Region, Northeast Region, etc), each with an pricy bureaucracy headed by a high-cost administrator. Perhaps this made sense 50 years ago, but no longer. Forecasters are constantly complaining about the lack of value of the regional bureaucracy. I am encouraged that some of our elected representatives, like Senator Maria Cantwell and the House Science Committee, having taken notice of the abysmal current situation. I hope their influence can address the poor decisions of NOAA management. Collapsing Bridges: A Washington State Tradition! There is probably no area of the country more famous for bridge collapses than Washington State, with many of them weather related. The costs of local weather-related bridge disasters undoubtedly exceeds a quarter-billion 2013 dollars. Our region is particularly vulnerable to such bridge losses, with long floating bridges and the powerful winds associated with our terrain and incoming Pacific cyclones. The latest bridge collapse near Mt. Vernon is an exception to the rule, since weather did not play a role. 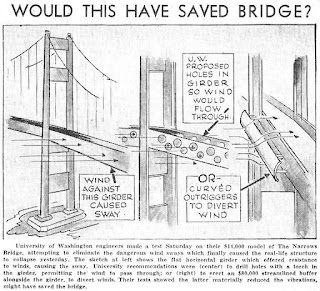 Let's begin with perhaps the most famous of the bridge failures, the one shown in virtually every introductory physics class in the country: the Tacoma Narrows Bridge, also known affectionately as Galloping Gertie. ( Click on the picture below to see a video.) Gertie, located in a channel between the Kitsap Peninsula and Tacoma (see map), started gyrating and then collapsed on November 7, 1940. Two hours later, the winds reached 42 miles per hour near the bridge's east end, and fishermen near the west end reported "substantially" stronger gusts. In the subsequent few hours the bridge started to oscillate or "gallop" and failed around 10:30 AM. Poor design, coupled with strong winds, destroyed this suspension bridge. 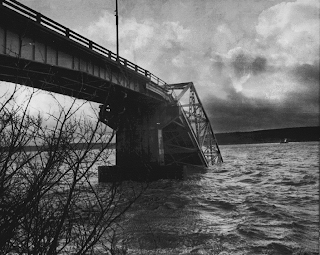 The most expensive local bridge failure was undoubtedly the Hood Canal Bridge, which failed during a freak windstorm, one in which gusts at the bridge reached well over 100 mph. At first the origin of the winds was a great mystery. 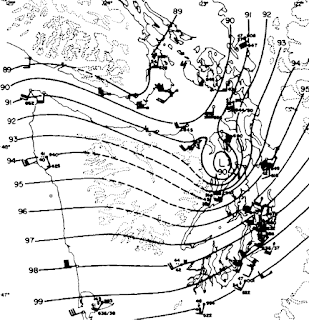 A strong Pacific cyclone was approaching the coast of central Vancouver Island (see figure). Forecasters expected winds of 30-40 mph over Puget Sound and nearby waters. But unexpectedly the winds accelerated to 100-130 mph over a very limited area around the Hood Canal Bridge. Massive tree falls occurred in the vicinity. After hours of pounding, a section of the bridge failed as the wind and wind driven waves struck the structure. But why the huge winds? Professor Richard Reed of my department was hired to figure it out and did. By collecting every conventional and unconventional observation in the area he demonstrated that an intense mini-low pressure area formed near the bridge as a result of an unusual flow off the ocean interacting with the Olympic Mountains (sort of like an eddy in the lee of big rock in a stream--with the Olympics being a VERY big rock). Here is a pressure analysis produced by Professor Reed. Strong winds were coming in off the Pacific and then they accelerated wildly to the north as they approached the low center (winds accelerate as air moves from high to low pressure). The bridge was replaced at a cost of approximately $ 143 millions dollars. 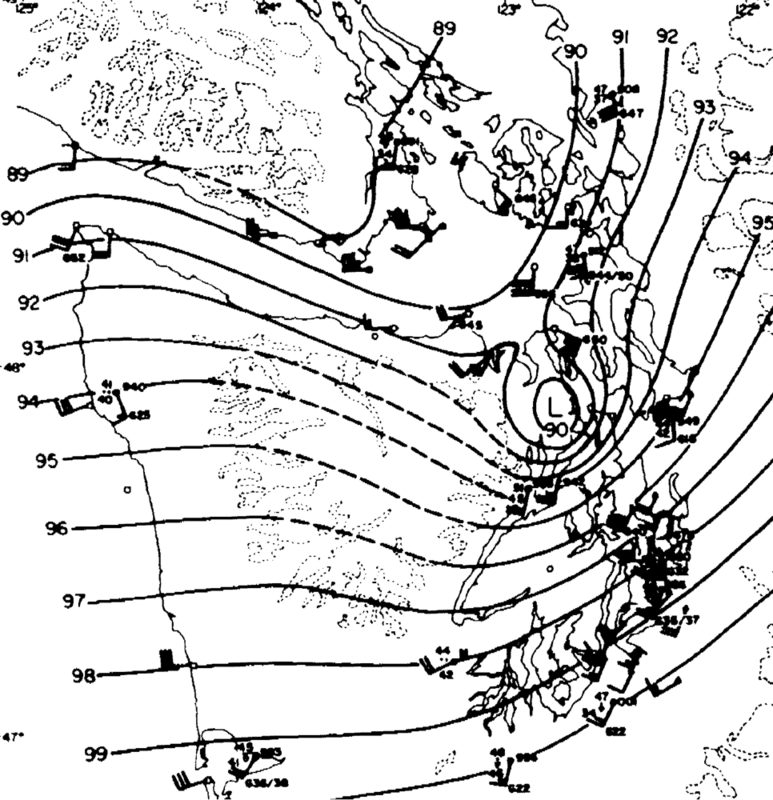 November 24, 1990 was a very wet, windy day over western Washington. There was widespread, major flooding on Western Washington rivers, two deaths, and $250 million in damage. Records flows occurred on the Elwha, Cedar, Snoqualmie, Skykomish, Snohomish and Stillaguamish. Another major Thankgiving holiday storm. On the 24th Seattle received almost 3 inches of rain and wind gusted to 35-40 mph. Heavy rain, rising lake levels, and open manhole covers contributed to the flooding of pontoons and the loss of the bridge, which was the world's first floating concrete pontoon bridge when it was dedicated in 1940. 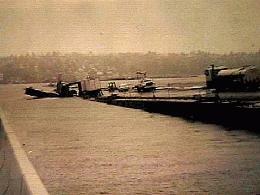 Another issue was that the pontoons were used to store contaminated demolition water. As the pontoons went down they also damaged cables for the new I90 bridge to its north. Click on the picture below to watch it collapse! The three weather-related bridge collapses may be the big ones, but weather related bridges incidents are legion around here. Major windstorms have damaged the cables holding the 520 bridge across Lake Washington in place. A truck was blown through the guard rails of the Biggs Bridge across the Columbia Gorge. The list is a long one. One thing is sure: Washington State bridges can be tested severely by local weather, flooding rivers, volcanic eruptions, and, of course, earthquakes. 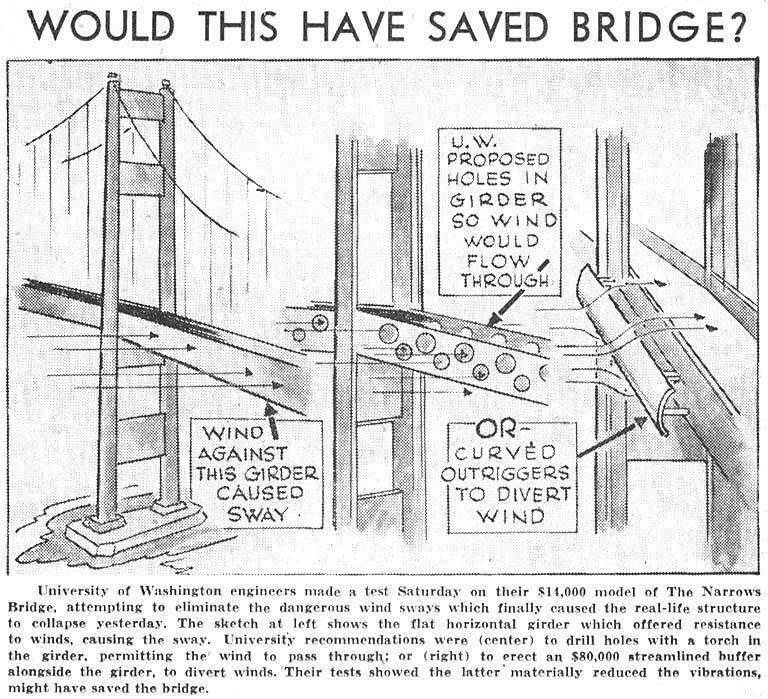 The current 520 bridge would be very vulnerable to a truly major storm, such as the 1962 Columbus Day Storm...fortunately it is being replaced. WSDOT did a simulation of what would happen with a storm with sustained 75 mph winds (about a once in 20-30 year event)--the current bridge would be history. Click on the picture below to see the scary results! Announcement: I will be teaching Atmospheric Sciences 101 (WEATHER) at the UW this fall. This class is accessible to folks 60 or older at very little cost (the UW Access Program) and, of course, to regular UW students. This class will give you a good basic understanding of the atmosphere and Northwest weather. Memorial Day Forecast Gone Wrong? Yesterday's models ALL had a major timing error.....the front is coming in must faster than predicted and rain has just reached Puget Sound (see radar at 8:20AM below). So rain today. But perhaps this will allow the front to clear by dinner for some of you. STEADY RAIN OVER BY 2-4 PM! The forecasts were too optimistic for today for much of Washington. On Sunday morning, the radar shows lots of showers over the Cascades and the western side of the state and the visible satellite image shows plenty of clouds (see below). Yet the media were going for an improving trend as late as last nigth, with one TV station talking about sun and 70F on Sunday. My forecast was online on this blog and updated in KPLU (my audio is found here)--and yes, it was not perfect. My take was that there would be clouds and showers on Saturday, with some sun breaks and that things would improve Sunday afternoon. That clouds and rain would be worse to the south. But there was something to be concerned about: the European Center model (ECMWF), the gold standard for numerical weather prediction, was bringing much more moisture and light rain into the region on Sunday than the U.S. models. The European Center forecast was right. And all the models showed a front approaching Monday, with rain spreading north during the afternoon. The current runs agree with this. The differences among the models were subtle as were the errors in the U.S. model solutions. Let me show you what changed. Here is the UW WRF prediction for sea level pressure for Sunday at 11 AM that was initialized only a few hours ago-very close to the truth. You will notice a weak low over the coast--this is associated with moist southerly flow entering western WA and upward motion...bringing clouds and precipitation. In contrast, the second panel gives the forecast for the exactly same time but started on Friday morning ..no low and there was a weak trough off Oregon. This kind of small scale feature can be difficult to forecast and clearly the EC model did better. 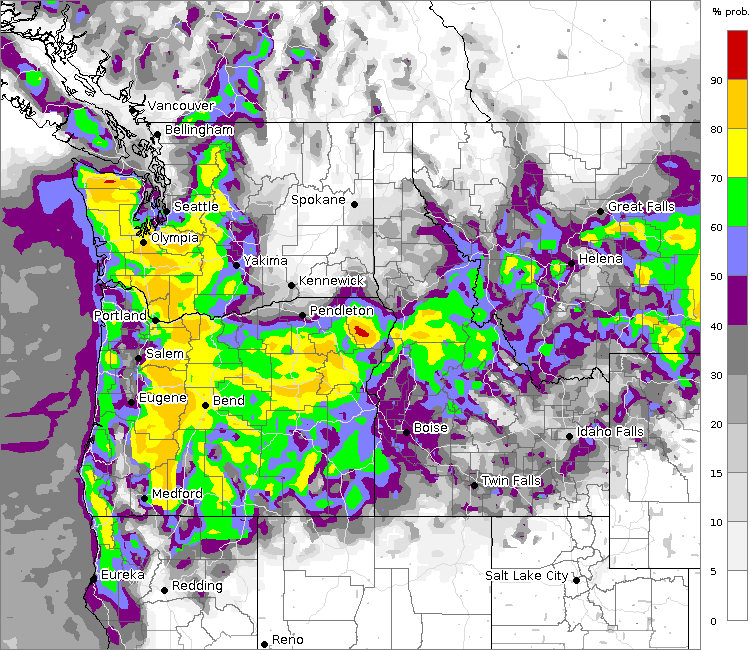 State-of-the-art forecasting is not dependent on one model prediction and the UW local ensemble forecast (making several forecasts, all reasonable but different) for daytime Sunday that was made Friday morning showed rain south of Seattle but drier to the north (the graphic shows probability of precipitation from the UW PROBCAST sysem). In reality, the precipitation spread north to Vancouver because of the offshore low. And Saturday was nicer than expected. So what about the rest of the day Sunday and Monday? The rain is now pushing northward and the Langley radar shows little behind it. So the coast is drying and soon the drying will push up into Puget Sound. The skies will brighten. Strangely enough, Friday's forecast for Sunday will still verify in one way...much better during the afternoon south of Everett. The visible satellite shows weak spots in the clouds behind....maybe a few sun breaks. So if you want to do something outdoors--there may be a chance this afternoon. Monday will start off dry, but the next front should push in with rain during the afternoon (and clouds a few hours before that). Here is the UW WRF forecast for precipitation for the 3 hours ending 2 PM Monday. Keep in mind the timing could be off by a few hours. Watch the radar to plan your outdoor activities tomorrow. If you are planning a Memorial Day barbecue....be ready for rain, particularly from Seattle southward after mid-afternoon. Memorial Day is not a dependable weekend around the Northwest...never has been, never will be. Generally we have a sunny, warm period in the middle of May (early May this year) and then we move towards the June gloom mode of low clouds. During the past few days we have had a closed upper low hanging over us (see graphic), with showers circling around, sometimes from the unusual easterly direction. With the low right over western Washington today, most of the shows have gone south of Puget Sound, hitting the Oregon coast and Willamette Valley quite hard, with some places getting 1-2 inches of rain. The next 24h will be more of the same (see graphic), with rain over Oregon, but very little north of Olympia. Northwest Washington would be a good place for a Friday hike or walk. I have good news and bad news for the rest of the weekend. The good news is that low will open up and weaken. There will be major breaks. The bad news is that the low/trough will hang around for much of the weekend, with some showers and plenty of clouds in the west. Oregon will be much wetter than Washington. Saturday will be bring clouds and some light rain showers over and west of the Cascade crest. Here is the 24 h total precipitation ending 5 PM on Saturday. Not the best day for a hike on the western slopes of the Cascades, and the Oregon coast will be damp. But Sunday looks much better over Washington, but still quite wet over western Oregon. (24 h precipitation ending 5 PM Sunday is found below). On Monday, a frontal system will be approaching the NW, but it will begenerally dry over Washington, except for the crests and windward slopes of the Cascades. Here is the forecast of precipitation at 5 PM on Monday. Eastern Washington is a good bet over the weekend for sun and warm temperatures (60s and 70s). And with the I5 bridge over the Skagit River collapsed, it will be a tough ride north on I5 through Mt. Vernon. One good thing about the cool, damp period of the past few days has been a substantial freshening of the snow about 3500 ft. Some good late-season cross country skiing and the Cascade and Olympic Mt. snowpack is well above 100% of normal. On Monday, an EF-5 tornado struck Moore, Oklahoma resulting in substantial loss of life, hundreds of injuries, and economic losses that will run into the billions of dollars. The storm had winds reaching 200-210 mph, was on the ground for 17 miles, and was observed from 2:45-3:35 PM CDT (19:45-20:35 UTC). How did the National Weather Service and the weather forecast enterprise do? Can we do better? This blog will provide some analysis and a few recommendations. Let me say at the outset, a lot went right and this event demonstrates the substantial improvements in weather prediction technology during the past decades. 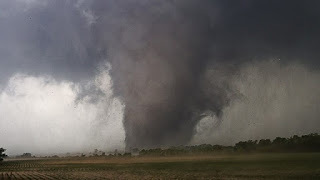 For several days before, based on a range of numerical forecast models and substantial knowledge of severe thunderstorms, the National Weather Service forecasters at the Norman, Oklahoma NWS office and staff at the NOAA/NWS Storm Prediction Center (SPC) had predicted the threat of severe thunderstorms on Monday over Oklahoma. Here is the graphical outlook for severe convection released on Sunday. Central and eastern Oklahoma was clearly in a high risk area. 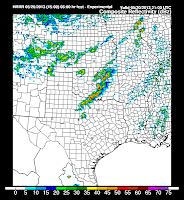 One of my graduate students, Luke Madaus, happened to be in Oklahoma on Sunday and several people commented on the potential severe storm threat for the next day. The next morning it was clear that the threat of severe weather was enhanced. Many of the numerical models showed the development of strong convection, although their solutions differed considerably in strength and position. The radiosonde (balloon-launched weather instruments) sounding at Norman, Oklahoma showed extraordinary instability (CAPE of roughly 5000 Joules per kilogram and plenty of vertical shear; CAPE stands for Convective Available Potential Energy. Northwest locations rarely gets above a few hundred, a few thousand is very large, 5000 is extreme). PLUS, there was a frontal boundary and a dry line that intersected near Norman, Oklahoma. A very, very big threat. Our nation is lucky to have the best severe storm forecasters in the world, backed by world-leading research at the National Severe Storms Lab, the University of Oklahoma, the National Center for Atmospheric Research, and many others). They proved themselves on Monday. The 11 AM CDT forecast (communicated via YouTube among other ways), painted out the threat and even talked about dangers to schools. (see image, click on it to see the video). You will notice that the warnings of severe thunderstorms was over an area. Our current level of forecasting technology, coupled with the substantial uncertainty and the chaotic nature of convection, made it impossible to do better. But an extraordinarily valuable forecast. A major threat was communicated well. 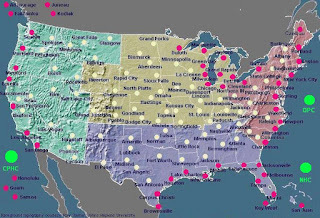 Then the next level of warming technology took over: the U.S. Doppler radar network. The U.S. has invested heavily in state-of-the-art Doppler radars across the country, radars that have recently been upgraded to dual-polarization (allows the radar to determine the type of precipitation or the nature of the "targets" it view). Around 2:30 PM the CDT the Doppler radar in Norman, OK observed the classic signs of a rotating, supercell tornado, including a hook echo and a mesocyclone (an area of rotation 5-10 km wide). The image below (at 3:06 PM CDT) shows the hook echo, with a "debris ball" at the end. With the radar image and reports from spotters, a tornado warning went out at 2:40 PM, 36 minutes before the tornado hit Moore. You may not think that is much, but 36 minutes is a far larger compared to the pre-radar days (average of 5 minutes in the 1980s). (Thanks to Mike Smith's blog for an analysis of the lead time issue). This is enough time to run the tornado sirens, put out warnings in the media, and to give folks a chance to move to safe locations...if there ARE safe locations. That is one big problem. For an EF-4 or 5 storm the damage can be catastrophic, with buildings either being blown away or experiencing severe structural damage. Safety can only be found in specially hardened rooms or enclosures. And such protective spaces were not available to many resident of Moore and for several of the schools. This needs to be changed. In short, National Weather Service forecasters did a magnificent job for this event. But could we do better? I believe the answer is yes. Because the atmosphere is chaotic (which means small errors in the initial state can have large negative impacts on the subsequent forecasts, impacts that increase in time) and the requirement of very detailed information to describe the initial environment for thunderstorm forecasts, it is virtually impossible to predict the details of severe thunderstorms a day or more ahead. And this is not going to change soon. Yes, we can predict that a major threat exists, but we can't get the exact locations or strength of the future storms correct. So the day ahead forecast will have to be broad brushed. But there IS the potential for major forecasting advances in the period from 1 to roughly 6 hours before the storm, if we can run models with enough resolution and can get enough information to describe the initial 3D atmosphere with lots of detail. And we need to run many simulations (called ensemble forecasts) to get a handle on the uncertainties of the forecasts. What kind of model resolution am I talking about? Probably 1-2 km between the grid points, which requires huge computer resources. We need to apply new ensemble-based data assimilation approaches (data assimilation is the technology of using data to describe the structure of the atmosphere). And this modeling system needed to be frequently updated, at least once per hour. We also need much more detailed information about the structure of the atmosphere, using innovative new data sources. For example, I have a graduate student, Luke Madaus, who is using pressures from smartphones to improve weather forecasts and he is planning on testing this approach with strong thunderstorms. 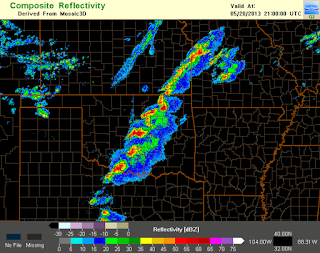 A potentially huge advance for convective storm forecasting. Unfortunately, the NWS support for this work (through the NWS CSTAR program) was cancelled for lack of funds....a tremendous frustration. One of the weaknesses of the NWS is its inability to support and take advantage of university research. The NOAA and the National Weather Service has been developing an early version of an advanced short-term, high resolution prediction system (the 3-km grid spacing High Resolution Rapid Refresh System, HRRR), which is only run in research mode because of the lack of sufficiently powerful computers in the NWS. 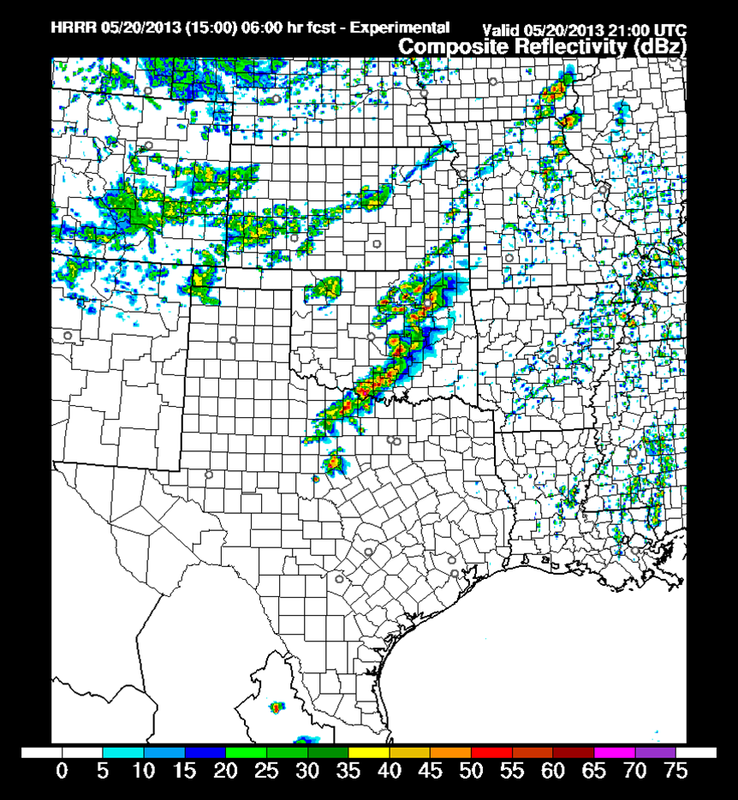 Below is an example of the HRRR forecast 6 and 3 hour out for 2100 UTC (4 PM CDT)----not bad, but not perfect). Skillful 1-6 hr forecasts are potentially achievable since the forecasts are short enough that the growth in forecast error is modest. And a few hour warming of a major storm allows sufficient time to evacuate folks from areas which severe weather is probable. To achieve better short-term predictions, more model development is needed, including higher resolution, state-of-the-art data assimilation, and moving to an ensemble approach. But with enough research and sufficient computer resources, we can do better. But the NWS did very well in this case. Yesterday was the 33rd anniversary of the eruption of Mt. 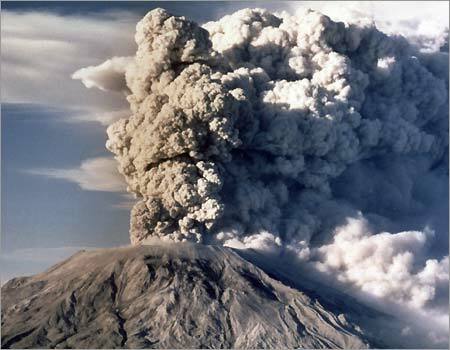 St. Helens, an event that devastated the mountain and surroundings and caused terrible problems on nearby rivers. But there is another story of the eruption and one far less known: its impact on local weather. The eruption produced a huge volcanic dust cloud that was mainly blown downwind (towards eastern Washington) by the prevailing winds. Here are a few weather satellite images that day (May 18,1980 at 8:32 AM), that clearly shows the eastward dispersion of the volcanic dust. Imagine if the volcano had erupted a few months earlier when the winds are more typically from the south--the nearby Puget Sound region would have been crippled. What were the meteorological impacts of this dust cloud? I decided to investigate this with the help of Professor Alan Robock of the University of Maryland (now at Rutgers). Here are the temperatures at Yakima and Spokane during that period (this is from a paper we wrote in Monthly Weather Review). As the plume went over Yakima, day turned to night. There was a slight cooling as the sun was obscured and then the temperature remained virtually constant for over 12 h. Why? The thick volcanic cloud acted as a very effective blanket: solar radiation couldn't get in, infrared radiation couldn't get out. The cloud hit Spokane a bit later in the day (they had more time to warm) and was a bit thinner there, so the impacts were less. How much did the cloud influence temperatures that day? We estimated this by taking the difference between a very skillful forecast system (MOS, Model Output Statistics) and what actually happened. The next plot, which shows the estimated cooling in Celcius at 5 PM that day, shows what we found. Over portions of eastern Washington the volcanic cloud caused temperatures to cool by around 8 C (14.5F), with cooling of roughly 9 C extending to the Idaho border. 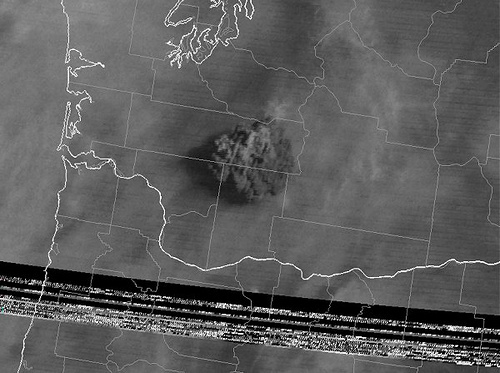 The dust cloud rapidly spread into Idaho, Montana, and Wyoming (although thinning as it moved eastward). Those locations were able to warm up during the day and then the dust spread over during the night. The volcanic cloud, like all clouds, reduced the amount of infrared cooling (we cool at night because the earth radiates infrared radiation day and night, and at night there is no warming from the sun). Thus, the cloud caused the temperatures to be much warmer than they would be otherwise (there were few meteorological clouds). Here is the proof: the estimated temperature changes due to the volcanic cloud at 5 AM the next morning: 8-12 degrees (C) warmer over western Montana! The weather effects of the Mt. St. Helen's dust cloud rapidly weakened during the next few days as the dust thinned and moved to the east. Interestingly, this eruption had virtually no climatic effects. The reason: the effluent from the volcano had relatively little sulfur content (SO2). Injecting this gas into the stratosphere is the main way to produce long-lived volcanic hazes that spread around the planet and cool the lower atmosphere for a few years. In fact, some folks would like to try cooling our warming planet by doing this artificially--injecting large amounts of particles into the stratosphere to reflect some of the solar radiation. But that is the subject of another blog! Announcement: I will be teaching Atmospheric Sciences 101 (WEATHER) at the UW this fall. This class is accessible folks 60 or older at very little cost (the UW Access Program) and, of course, to regular UW students. This class will give you a good basic understanding of the atmosphere and Northwest weather. 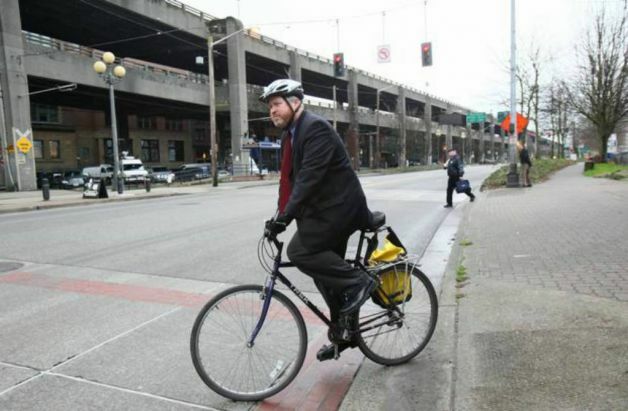 Today is bike to work day and thus there is no better time to discuss how you can bike on most days without fear of getting wet....or at least very wet. Yes, even here in the Pacific Northwest a little meteorological knowledge and technology can help you avoid those raindrops and enjoy a very pleasant ride on your bicycle. You might be surprised, but the Northwest is one of the best places to bike commute or enjoy recreational biking in the nation. Think about it. What are the worst conditions for biking? That's easy: icy and snowy roads. It's cold and accidents are inevitable. Good news: western Oregon and Washington have very little snow and ice. Biking is miserable in hot, humid weather like during summer in the southeast U.S. and the extreme heat of the southwest. Again, we luck out: we rarely see such conditions. Very heavy precipitation, such as in thunderstorms. is really bad for biking and lightning is dangerous. No problemo here!--we get less thunderstorms than almost anyone else. Ah, yes, the rain. But consider our rains are concentrated in only a few months (November through February) and the rest of the year is really pretty dry. Our annual precipitation (e.g., Seattle gets about 37 inches a year) is far less than most of the central and eastern parts of the U.S. And when it does rain, it is generally quite light; a rain resistant jacket and pants, coupled with our mild temperatures, leads to a pleasant ride. Heavy showers like this are very rare in the Northwest. But it gets even better for you bicycle commuters and enthusiasts! Even when we have wet days it rarely rains steadily for a long period of time. If you can shift your trip by a few minutes, you can often escape the rain. I bike to work nearly every day and rarely get very wet. Case in point, the in famous shower and sunbreaks. Much of our precipitation comes after a front goes by and we get into cool, unstable air. Such precipitation is convective, meaning we get hit by a shower and then there is a break, followed by another shower an hour or more later. Here is a radar image showing you an example of this....the showers are coming in from offshore. 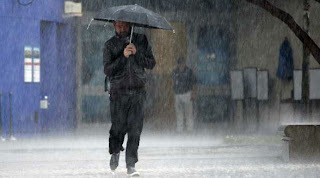 Such rain is easy to avoid, wait for the shower to pass and then head out on your bike. And even in other weather situations rain is almost never uniform and all you have to do is make sure you wait for the dry or light rain areas. How can you do that? Smartphone technology solves this problem! 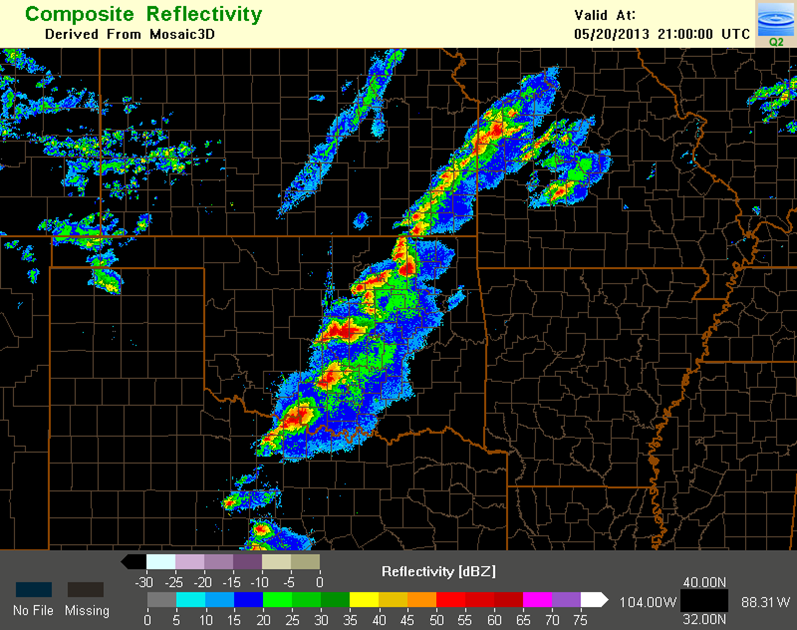 There are now hundreds of weather radar apps that give you the latest radar image and a radar animation. It even shows where you are on the image using the GPS or cell-tower navigation function on your phone. Easy to see the dry spots coming! And some radar apps will even tell you exactly when the radar will start. Some are free, but the best ones cost a few dollars. I use Radarscope (see image below) and some folks use DarkSky, which gives you the timing (but reviews are mixed on this one). 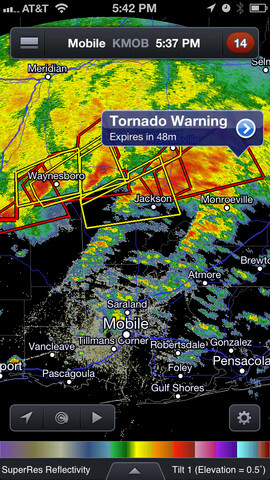 Radarscope (left) and DarkSky (right). I have been trying to convince a few of my students to create a weather-radar-based bicycle app, where you put in your route and tells you when the coast is clear. And one more thing. It is virtually NEVER raining everywhere around here because of our mountains. If there is a convergence zone going on, with precipitation over north Seattle, head north or south for a dry ride. Wet frontal system over the entire region, with typical southwesterly flow? 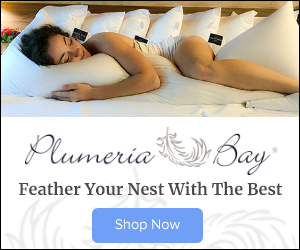 No problem, head to Sequim, Port Townsend, or northern Whidbey. Our Mayor knows how to find the dry spells.